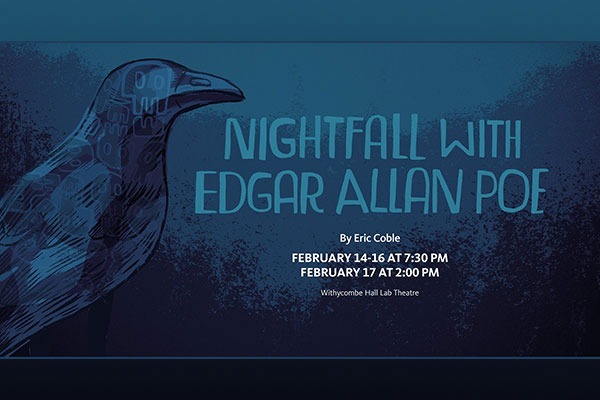 Oregon State University Theatre will present “Nightfall with Edgar Allan Poe” by Eric Coble Feb. 14 through Feb. 17 in the Withycombe Hall Lab Theatre on the Oregon State University campus in Corvallis. The ensemble cast includes OSU students Patrick Miller, Cole Haenggi, Colin TaylorMays, Nicole McKinney and Yihong Lu. The play will be directed by OSU Theatre student Lindsey Esch, who is working on her first full length production. Esch has created a haunting atmosphere in collaboration with student scenic designer Robert Reeder and costume designer Rue Dickey. “I hope audiences will feel unnerved and walk away with a better understanding of the power that both writing and theatre have in changing one's mental and emotional states,” Esch said. The show will be held at 7:30 p.m. Feb. 14, 15 and 16 and at 2 p.m. Feb. 18 in the Lab Theatre, 2901 S.W. Campus Way, Corvallis. Tickets are $8 for general admission, $6 for seniors, $5 for youth/students and $4 for OSU students. They are available through the OSU Theatre Box Office at 541-737-2784 or online. Contact the box office for DAS accommodations and/or group ticket sales.